Almost as soon as a meteor burned up in the sky above Russia today, firsthand accounts appeared on the Internet, complete with dashcam videos and photos of the meteor’s train. But in 1908, when an asteroid or comet fragment exploded about five miles above the earth’s surface, destroying 800 square miles of boreal forest in central Siberia and uprooting 80 million trees, the area was so isolated that it took decades for eyewitness reports to emerge. Leonid Kulik, a Russian mineralogist who was the first scientist to investigate the incident, traveled into the forest by raft to gather evidence in 1927. Kulik reported on his trip in the Journal of the Russian Academy of Science, and included excerpts from eyewitness accounts. The translations below were published in 1935 in Popular Astronomy, and reprinted in a 1962 article in the Journal of the Royal Astronomical Society of Canada. Perhaps because it occurred in such isolation, the Tunguska Event has inspired many theories about its provenance: a black hole fell through the earth; a chunk of antimatter landed in Siberia; one of Nikola Tesla’s experiments went horribly wrong. Scientists still debate whether the body which burned up above the taiga was a fragment of a comet or an asteroid. But they are sure it was one of the two. Scientists at the University of Bologna who have been researching this event for years host a site full of photographs and scientific publications. An informal group of researchers maintains an extensive archive of primary documents, in Russian, related to the Tunguska strike. 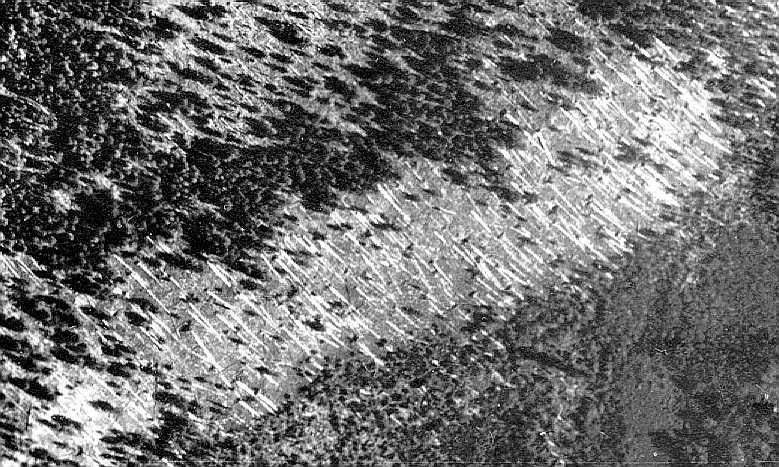 Photo from an aerial survey of the Tunguska region, 1938 (thirty years after the event). Courtesy of the Tunguska Page, Bologna University. Recent photo of damage from the 1908 strike in the Tunguska region. Courtesy of the Tunguska Page, Bologna University.